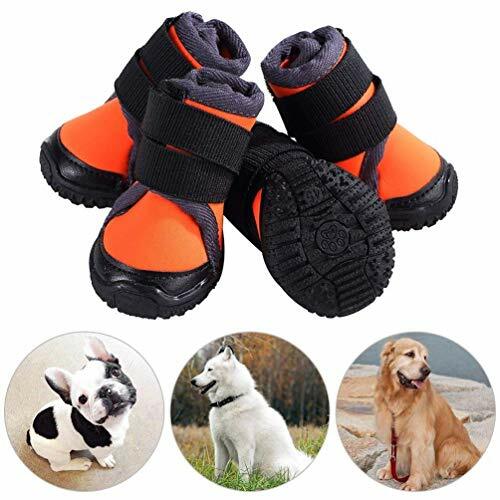 This pair of pet boots will serve as a good partner for your dog, protecting his / her paws against injury from sidewalks, sandstone roads, asphalt, sharp grass, etc. The dog shoes are attached with velcro strap that are long and adjustable, prevent slipping and provide a custom tightness for a secure closure. * The data in the size chart shows the inside size of the shoes, if the inner length of the shoe is 4cm, it is suitable for dogs with 3.6-4cm in length. * Although the soles are waterproof, the dog boots can not be used in deep water, because the water can penetrate through the sewing needle holes. ️️️️❤️️️️️❤️ Non-slip soles, dogs will not slide when walking on rainy days. ❤️️️️️❤️ Velcro straps, easy to wear, not easy to drop down, suitable for medium and large dogs. ❤️️️️️❤️ Lycra fabric, comfortable and flexible, breathable not boring feet, the dog will not feel stuffy on a long time wearing sports. ❤️️️️️❤️ Effectively protect the dog paws from damage of heat of snow, high temperature, stones, glass, etc. suitable for a variety of outdoor activities, and can wear it indoors to protect furniture. ❤️️️️️❤️ Please measure the dimensions of your dog's paws before buying if the dog shoes are suitable for your dog. If the measured size is between two sizes, please choose the larger one. If you have any questions about this product by JunBo, contact us by completing and submitting the form below. If you are looking for a specif part number, please include it with your message.